Prominent & Leading Manufacturer from Delhi, we offer agriculture spray hose. Owing to the expertise of our professionals, we have emerged as the foremost organization of an excellent quality array of Agriculture Spray Hose that is used mostly in agriculture industry. It is precisely manufactured using topmost grade raw-material and the latest technology in tandem with set industrial norms. 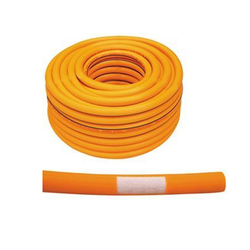 According to the specific clients' requirements, this hose is made available in various specifications. Clients can avail the entire range from us at affordable price. For carrying power cables in glass works, electrical furnaces, servicing in iron & steel industries for protection from exposure to high temperature, current leakage, radiation from steel furnace, open flame and splashes of hot metal. Cover Oil, heat and electrical resistant synthetic rubber compound with or without asbestos outer.